Story added: 13 May 2007 20:52. Last updated: 13 May 2007 20:53. Convergence - there's a buzzword for you, and nobody is embracing it more than Nokia with its latest mobile phone, the N95. Not content with giving you just a phone, the chaps at Nokia have crammed in a dedicated music player, 5 megapixel camera, satnav, Wi-Fi, 3G and HSDPA connectivity, Bluetooth, blogging tools, the ability to get your emails on the go and pretty much every other feature you've seen on a phone to date. Is this all too much, or just the next logical step? Slightly larger than Sony Ericsson's W810i Walkman phone, compared to other slimmer phones on the market this is no size 0 model. The design is dominated by the 2.6-inch screen on the front of the model and this slides both up and down to reveal the controls. Sliding down reveals the dedicated music buttons; play, stop, fastforward and reverse as well as flipping the display to landscape rather than portrait. The music interface is simple to use and you can search for songs via the usual array of things such as artists, albums, genre and playlists. Disappointingly there is no microSD memory card shipped in the box and with only 160MB of phone memory for all your media assets (pictures are around 700k and music around 3MB) it's something you'll have to invest in from the start. Back to the music aspects, and the phone has a small speaker built-in so you can listen without headphones. It's not the best speaker in the world, however we were surprised by its performance. Better still the N95 has a 3.5mm jack on the side so you can connect it directly to a speaker or headphones. Unlike Sony Ericsson Walkman range, you don't need to use a specific dongle, however, and you'll love this, we did find that without a cap it had filled with pocket lint by the end of our 1-week trial. Moving on from the music to the camera, as we've said the Nokia N95 sports a 5 megapixel (2592 x 1944 pixels) camera complete with Carl Zeiss optics, Tessar lens, and MPEG4 VGA video capture of up to 30 fps. The camera is turned on via the lens shutter, which is considerably smaller than Sony Ericsson K800 range and like the Cyber-shot models the phone is held landscape. Controlling and changing camera settings again is easy thanks to a combination of on and off screen buttons however we did find considerable time lag between taking a picture and it actually capturing it. This resulted in fast moving subjects being either blurred or out of frame completely and while the 5 megapixel headline might make you think that you can ditch your compact camera we wouldn't bet on it just yet. Picture quality on the whole is very good (see images compared to the Pentax A30). Next up is the built-in GPS device insuring that you won't get lost. For this to work you have to have the phone open (i.e., slider out to reveal the keypad) because the GPS receiver has been tucked in underneath. Compared to TomTom or Navman the software isn't the easiest thing to use and requires you at times to pull data from either a wireless connection or 3G/HSDPA. Rather than supplying all the map data from the beginning the Nokia N95 downloads maps on the fly automatically saving them to the phones memory or an inserted memory card. The map downloads are free, but depending on how you download the data will cost you for the transfer from your service provider. As well as showing you maps (the opening sequence is very Google Earth) you can also more importantly use the software to get you from A to B. If you want audible instructions there is an additional cost attached and prices start from ?? ?5 for a 5-day trial to ?? ?50 for 3-years. With no Point of Interest data installed, city guides are also an optional extra. If you thought that's all the phone does you would be mistaken, as we said at the beginning this phone is all about convergence so web surfing, the ability to check your email, listen to the radio, file photos to Flickr and so much more are all present. Depending on whether you going to buy your phone directly from Nokia or via an operator will depend on whether you get access to the VoIP software. Basically Vodafone and Orange scared of cabinibalising their markets have opted for this feature to be turned off while T-Mobile let you have the phone unfettered. 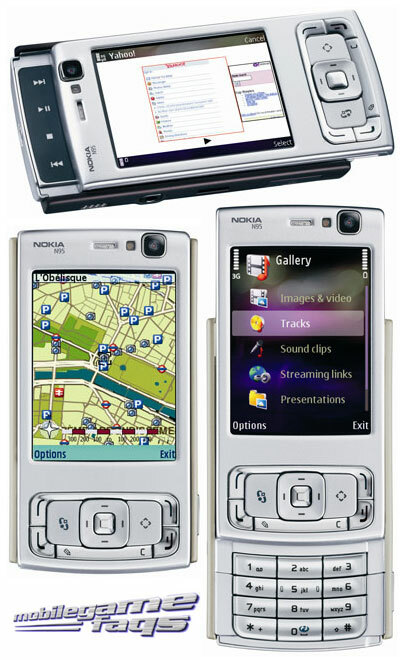 Trying to achieve so much is always a hard task and there are times when you will struggle with the Nokia N95. A jack-of-all-trades rather than a master of none this provides the functionality of a GPS, MP3 player, digital camera and of course phone, in one fairly small box. For the purists out there, none of the individual elements beat a solo offering, but then you wouldn't be able to get all those elements in your pocket without getting suspicious looks. So should you embrace convergence? The Nokia N95 is a very nice if not muddled at times piece of kit, still bar the lack of a QWERTY keyboard this is still one of the best smartphones available today. Buy the Nokia N95 here.